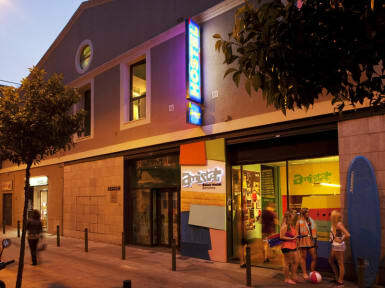 Amistat Beach Hostel just few steps away from one of the nicest beaches of Barcelona. We offer plenty of endless amenities (Pasta, WIFI, breakfast… etc.). A new youth property in Barcelona, with a 'cool' vibe, lots of activities like community dinners & night tours. Created by one of the most popular and trendy architect and interior designer. Your journey with us will be full of funny memories and amazing experiences. A great opportunity to meet fantastic people and travelers from around the world. We have a large and attractive common area equipped with everything you need for a pleasant stay, a massive iron kitchen to help you to developing your cooking skills. We are not just any another accommodation in Barcelona, our goal is to make your stay an unforgettable experience, both in and out of the hostel. We have a 24-hour reception with a friendly team who are always ready to go the extra mile to help our travelers. Our rooms are designed to ensure maximum comfort and all have air conditioning. - Air conditioning and heating throughout the building. - Vending machines for hot and cold drinks and snacks. - Laundry with coin operated washers and dryers. - PC to connect anytime Room Free! - Fully equipped kitchen, ready to prepare any dish! The list is endless…but we rather to see you at Amistat Beach Hostel Beach. Come and experience it yourself. Cancellation Policy: Free of charge up to 48 hours prior to arrival. The first night will be charged once past this deadline. Unexpected departure during stay: If a flexible booking, the next night will be charged after the day of notice. The rest of nights can be shortened with no penalties. In these cases, a prepayment will be required and cancellations will be allowed free of charge up to a month before the arrival date. Once past this period, penalty charges will be applied. A non-refundable policy will be applied for stays that go through high demand dates, such as Mobile World Congress (from 25 to 28/02 2019), Primavera Sound (from 30/05 to 01/06/2019) and Sonar (18 / 07 to 20/07/2019). We reserve the right to charge 100% of the reservation at the time of booking. The hotel will reserve the right to validate the credit card prior to arrival. Minors not accompanied by parents or legal guardians are not able to share room with other customers. Complete dorm or private needs to be booked. Also will need a parental permission to stay in the hostel. At check-in time is required to pay EUR 10,- per person as a deposit, to be returned at check-out once the card room and sheets returned. For the locker bring your padlock or buy it here. VAT tax included in all prices. - People who refuse to present their legal identification documents when requested by the hotel staff. - People who manifest violent or aggressive attitudes, who carry weapons or objects that can be used as such. - People with clothes or symbols that incite violence, racism or xenophobia. - People who show symptoms of having used prohibited substances. - People who are aggressive or dangerous to other guests and to themselves may be expelled from the hotel. Great hostel. Located near the beach and very clean. Awesome common areas Free pasta and cheap paella for dinner. Great staff specially Xavi and Jenny. They are the best. Thank you so much guy. I'll come back for sure! Lovely staff, very clean and near the beach.